Convert your images to GIF. It's simple. ReaGIF is a powerful image convertion tool. Using ReaGIF you can convert you images to GIF format either one by one or all at once as a batch job. 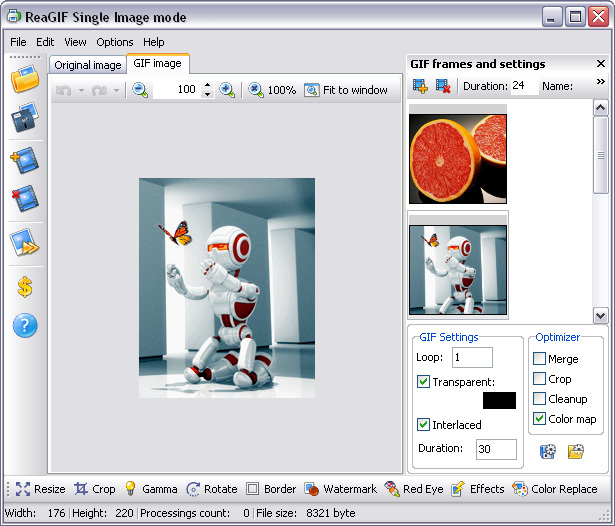 Built-in image editor provides several popular image manipulation functions, including resize, crop, rotate, mirror, brightness, contrast, border, watermark, red eye correction and a dozen of various artistic effects. Batch job automation features include Windows Explorer right-click menu integration and command-line usage capabilities. If you have any any problems, questions or suggestions, feel free to contact our technical support.